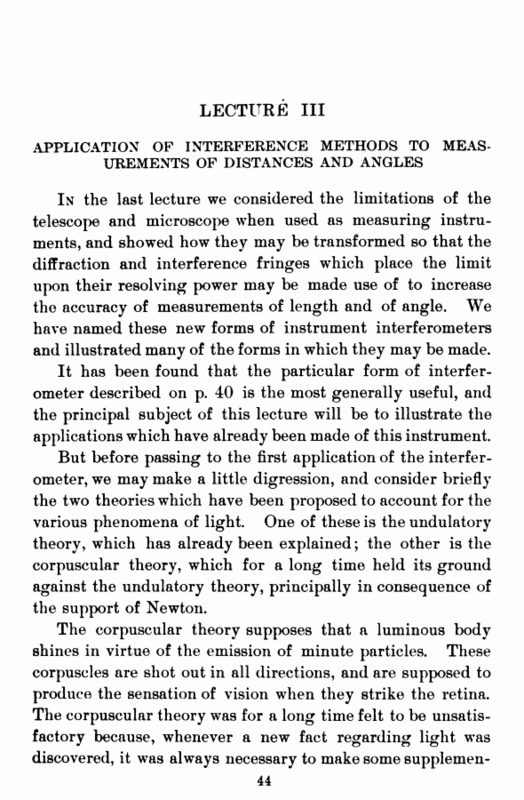 tary hypothesis to strengthen the theory; whereas the undulatory theory was competent to explain everything without the addition of extra hypotheses. Nevertheless, Newton objected to the undulatory theory on the ground that it was difficult to conceive that a medium which offers no resistance to the motion of the planets could propagate vibrations which are transverse (and we know that the light vibrations are transverse because of the phenomena of polarization), for such vibrations can be propagated only in a medium which has the properties of a solid. Thus, if the end of a metal rod be twisted, the twist travels along from one end to the other with considerable velocity. If the rod were made of sealing wax, the twist would rapidly subside. 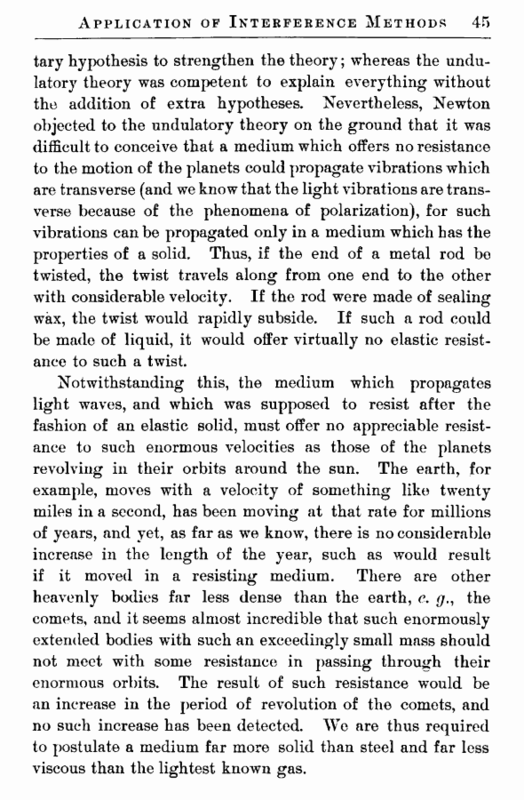 If such a rod could be made of liquid, it would offer virtually no elastic resistance to such a twist. Notwithstanding this, the medium which propagates light waves, and which was supposed to resist after the fashion of an elastic solid, must offer no appreciable resistance to such enormous velocities as those of the planets revolving in their orbits around the sun. The earth, for example, moves with a velocity of something like twenty miles in a second, has been moving at that rate for millions of years, and yet, as far as we know, there is no considerable increase in the length of the year, such as would result if it moved in a resisting medium. There are other heavenly bodies far less dense than the earth, c. g., the comets, and it seems almost incredible that such enormously extended bodies with such an exceedingly small mass should not meet with some resistance in passing through their enormous orbits. The result of such resistance would be an increase in the period of revolution of the comets, and no such increase has been detected. We are thus required to postulate a medium far more solid than steel and far less viscous than the lightest known gas.